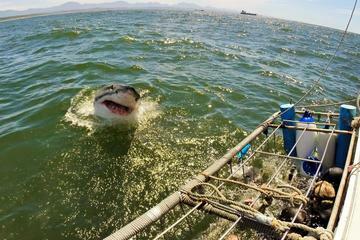 Home » Garden Route » Shark Cage Diving Mossel Bay (Great Whites & Tours) Where To Book? Shark Cage Diving Mossel Bay (Great Whites & Tours) Where To Book? One of the most exciting and adrenaline pumping activities you can do in the waters of South Africa, is shark cage diving. Diving down into the open sea, with only metal between you and the greatest predator in the ocean. South Africa is known for having the biggest and baddest Great White sharks in the world, and seeing these creatures up close, and in their natural habitat, is a must for any local or tourist. This 6-hour excursion will take you into the heart of Great White territory, off the coast of Mossel Bay. Not only are you going to enjoy the thrill of cage diving with these incredible creatures, but you can also experience an afternoon tour of this old town. At 10 am, you will meet your driver at the Mossel Bay cruise port. From there, you will head to the launching point for your dive. Considering Mossel Bay has warm waters, and nearby Seal Island, this is the ideal location for seeing these marine beasts. Depending on what time you leave and the water conditions, you will be in the cage and ready to dive by 11 am. The incredibly helpful and knowledgeable crew will submerse you into the water, before chumming around the cage to call the sharks in. If time permits, you can finish your tour with a trip to the Bartolomeu Dias Museum Complex, which explores and explains the culture and history of the Mossel Bay region. The excursion will then end at 4 pm, when you are dropped off back at the port. N.B. This tour is ideal for anyone who is wanting to explore and experience the beauty of the Great White Shark. You will need at least two people to make a booking, and it is not advised to bring children along. This 5-hour excursion will take you deep into shark territory, and get you up close and personal. This excursion is also slightly more flexible, as there can be as many as 3 trips taken daily, depending on the time of year and how busy the day is. Times will vary depending on the weather conditions and time of year. 08:00 – Meeting at the shark diving crew house, where you can enjoy breakfast and have a safety briefing. 09:00 – Boat launch from the Mossel Bay Harbor. 09:10 – You will reach the diving area and can spend between 3 to 4 hours at sea diving. There will be a light lunch, snacks and drinks supplied on board. 12:30 – Return to the crew house. 12:40 – You can enjoy afternoon tea and watch the video of the day. 13:00 – Time to pack up and depart from the crew house. 13:00 – Meeting at the shark diving crew house, where you can enjoy breakfast and have a safety briefing. 14:00 – Boat launch from the Mossel Bay Harbor. 14:10 – You will reach the diving area and can spend between 3 to 4 hours at sea diving. There will be a light lunch, snacks and drinks supplied on board. 17:30 – Return to the crew house. 17:40 – You can enjoy afternoon tea and watch the video of the day. 18:00 – Time to pack up and depart from the crew house. You can pay a R50 deposit for a towel, which will be refunded at the end of the trip. For R300, you can purchase a DVD of your adventure. There are also disposable, underwater cameras available for purchase for R250. This tour is ideal for anyone who has never been in the water, as you do not need any experience, and you will also learn everything you need from the crew, the safety briefing, and during the trip. This tour also takes place year-round, but times and days can change depending on the sea and weather conditions. The tour company will let you know in advance if there might be possible changes. The Sharks and Claws Tour, this tour allows you to experience the beauty of sharks in their natural habitat, but also get to see the big cats of the world. They will walk freely with you, as you amble through their home. You first head off to the dock, and once you are on the boat it will only take about 10 minutes to get to the shark site. Once you are at the shark site, the real fun begins as you hop into the cage and get lowered into the water. By this stage, the crew would have chummed the water sufficiently to encourage the sharks to come up close. This is also brilliant for anyone who is a non-diver, as you can sit on top of the boat and enjoy the sharks, without having to get into the water. This part of the trip usually lasts about 4 hours, and there is a light lunch, snacks and drinks available on the boat. You will then head back to the harbor, and from there take the trip to the Botlierskop Nature Reserve for the bush safari. You will enjoy the safari will be enjoyed in an open top 4×4. You will experience many free-roaming animals such as Rhino, Giraffe, Buffalo, Lions, buch bucks, and many other animals, before returning to your hotel. This package is absolutely brilliant for anyone wanting to experience the best of both the land and sea. The package sizes also vary from 1 pax, all the way up to 13+ pax, meaning you can go as a family, small group, or as a tour group. Much like the Sharks and Claw Tour, this tour allows you to experience the the beauty of sharks in their natural habitat, but also get to see the big cats of the world. They will walk freely with you, as you amble through their home. You will start your day by heading to the harbor to meet up with the crew and receive a safety briefing. You will then take the short, 10 minute journey to the dive site, where they will lower the cage and you can start viewing the sharks. Once again, the chumming will have made the sharks get incredibly close, perfect for the cage diving as well as for non-divers to enjoy them from the roof of the boat. Whether you are diving or not, this experience is one to remember. Once your shark cage diving experience is over, you can enjoy a light lunch, snacks and drinks on the boat, before heading back to the dock to relax a bit. You will then head to the Walk with African Lions experience. This walk is definitely one to remember, as you will be able to walk through the bush with fully grown lions. They are not on leashes and do not wear collars, but you will be supervised and managed with an experienced team. This tour is your chance to experience the two biggest predators on the African continent. You get up close to these beautiful animals, get to see them in their natural habitat, as well as interact with them in this once in a lifetime adventure. These tours are incredibly unique to this part of the world. The Great White population here is the biggest in the world, and to get within touching distance of these majestic creatures is a must for any local, or traveller.